Getting hit is a common fear and it prevents a lot of people from progressing in martial arts. This is especially true in boxing, where the majority of people “head hunt.” But this is a fear that you have to get over in order to get better. Sparring is a necessity and ultimately what separates real martial arts and fake martial arts. So how do you get over your fear of getting hit? Here are some tips that have helped me get over my fear of getting hit. 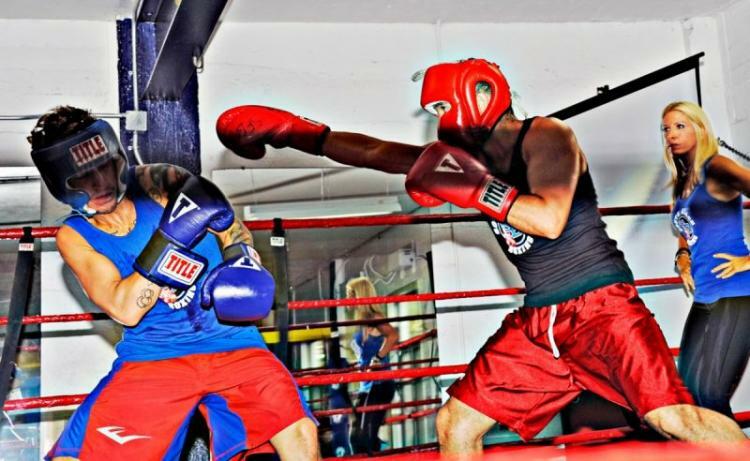 The number one rule if you are new to sparring is to spar with someone who you feel comfortable with, someone that is willing to go light and can help you out. There is no sense in putting someone who doesn’t know how to spar with someone who is just going to beat you up handily. So before you concentrate on anything else, just do that. Pick someone who will tone down the intensity. Then once you get more comfortable sparring, then you can bring up the intensity and work with some brawlers. Before you go spar, hopefully you have a lot of experience doing live drills. Live drills are dynamic drills done in a sparring-like scenario. Live drills gets you more comfortable with getting hit, playing defense, and throwing combinations—all skills needed in a real sparring match. Additionally, you get to experience a little bit of what a sparring-like scenario would be like, without actually sparring. For this drill, both my partner and I are in the pocket. I would try to throw a 3-punch combo then he would then throw a 3-punch combo. We just take turns throwing 3-punch combos back and forth. However, to make this drill realistic, the person on offense should try to adjust for proper angles to land clean opening shots. Also, the person on offense should learn how to set up punches. Conversely, the person on defense should try to block all the incoming shots. There is also another variation of this drill I like doing where you vary up the amount of punches each person throw, that way it makes the defense and offense much more unpredictable. So during one turn, you could throw 3 punches and then the next you are throwing 6. This is another live drill I love to do for kickboxing. It is a live drill where my partner and I take turns going on offense and defense (like the drill above). But we stipulate that any combo we throw should end with a kick. And like the drill above, the person on offense should take good angles to land clean shots and should also be setting up shots. That is what Dutch kickboxing is known for. The person on defense should actively play defense—including catching and checking kicks. Another great drill you can do is to put yourself in a confined space or against a wall/corner and have your partner start punching you. Your job is to fight out of it. In doing this drill, it forces you to keep your eyes open, fight back, and find a way out of a sticky situation. You can get out of the wall/corner by punching back, bobbing/weaving, blocking, or cutting a corner out. As a beginner being put in this situation, you will feel super tense—but learn to relax and have your partner start slow and slowly escalate when you feel more comfortable. By going slow, you will be able to practice seeing the punches come and also practice keeping your eyes open. When you still aren’t comfortable with keeping your eyes open and seeing the punches, try to stay in there a longer so that you can work on dodging and blocking the punches. But you have to remember, during a live sparring situation, you don’t want to stay in there long—get out of a corner as fast as possible during sparring.